I read somewhere that Prince had said this album has been 4 years underways. My personal guess is, that it has been underways for about 4 weeks. It is a compilation of previously released tracks, some of those in slightly different versions, and some tracks we hadn't heard before. 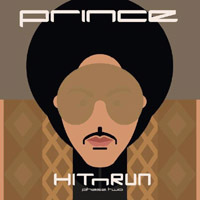 Compared to the previous album "HITNRUN Phase One" , this new one is much better. Gone are that horrible "Joshua sound" that was a pain to listen to, and this new album has a much more pleasant sound. The sound of real Prince. Extraloveable, Rock'n'Roll Love Affair, Screwdriver, Baltimore have previously been released as singles. All of these singles are catchy Prince songs and I like them all. I always felt that the guitar driven Screwdriver would have fitted in perfectly on the "PlectrumElectrum"  album. The funky Stare has also been available earlier as a download and so has Groovy Potential which would have been a nice addition to the "Art Official Age"  album, but it's nice to have it here in great sound quality. Revelation is a nice slow song with horns and great guitar and it is classic Prince at his best. Black Muse is perhaps the best track on the album. It begins with a very playful bassline and it is an instant Prince classic. As a matter of fact, it is not one but two songs. The last part of the song has previously been played live with the title 1000 Light-years Away. So if you want to, you can split it with a wave editor, and while you're at it, you should remove the last minute or so of silence from Big City. Big City is kind of annoyingly happy. Not impossible to listen to, but certainly not a favorite of mine. 2 Y. 2 D (Too Young To Dare) is much the same and not my cup of tea. Look At Me, Look At U is better, perhaps it's one of those songs that Prince has done a few too many times, but it's alright. When She Comes is a slow song, and quite okay I guess. Nothing special, but okay. If you wonder where the songs Free Urself and If Eye Could Get Ur Attention are, then you are right. Those download tracks would have fit in perfectly here. But I guess you'll have to take care of that yourself. This new album is a nice comeback from the Joshua produced crap, that made up half of HITNRUN Phase One. I hope it will be available soon on CD or LP, it certainly deserves a proper release instead of only being available as streaming or download.